1. Hajj is performed in this month. 2. 9th Zil-Hajja is a very sacred day. When asked about the fast of 9th Zil-Hajja (Yaum e Arafah) Rasool Allah (SAW) saw said, “It expiates the sins of the preceding year and the coming year” (Muslim 6: 2603). 3. 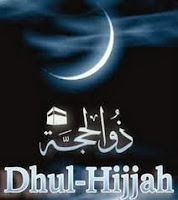 The first ten days of Zil-Hajjah are extremely sacred and good deeds are most beloved to Allah in these days. 4. The second Muslim festival Eid-Ul-Adha falls on the 10th of Zil-Hajja. 5. An animal sacrifice in memory of the sacrifice of Prophet Ibrahim (AS) is offered on 10th Zil-Hajja. Sacrifice has not been made obligatory by Allah Subhana Watala; however it has the status of being Obligatory Sunnah (Sunnat-e-Wjiba). Through this act, pleasure of Allah is obtained and also results in atonement of sins! Sacrifice has been commanded to the people in all the revealed laws (Shariat) since the time of Prophet Adam (AS) to Prophet Muhammad (SAW). Allah Subhana Watala mentioned this Sunnah in beautiful words in Surah Safaat: And he (Ibrhaim AS) said (after his rescue from the fire): “Verily, I am going to my Lord. He will guide me!” “My Lord! Grant me (offspring) from the righteous.” So we gave him the glad tidings of a forbearing boy. And, when he (his son) was old enough to walk with him, he said: “O my son! I have seen in a dream that I am slaughtering you (offer you in sacrifice to Allah), so look what you think!” He said: “O my father! Do that which you are commanded, Insha’ Allah (if Allah will), you shall find me amongst the patient ones. After seeing the dream, Ibrahim (AS) transcended all logic and sacrificed his most beloved possession, his own son, for the sake of Allah. Sacrifice is the symbol of full obedience and total submission to Allah. Ibrahim’s (AS) obedience, loyalty and sacrifice greatly earned the pleasure of Allah Subhana Watala and he was declared as a Muhsin and Khalil Allah (Friend of Allah) and his name and his sacrifice is remembered till this day. Five times a day, Muslims send their blessings on Ibrahim (AS) along with Prophet Muhammad (SAW). Allah Tala expects the same obedience and sacrifice from His slaves. In front of the command of Allah, there should be no excuses. In remembrance of this sacrifice of Ibrahim (AS), Muslims all over the world make a commitment that Oh Lord of the Worlds; We are your obedient slaves. Everything we possess belongs to you. If you command us, we will sacrifice our lives for the sake of Islam. Thus Sunnat of Sacrifice offered every year is actually the expression of a salve’s love for his Creator. The word Qurbani is derived from the word “Qurb”- nearness. Sacrifice is thus a form of worship through which love and nearness of Allah can be attained. “Say (O Prophet Muhammad SAW) indeed my prayer, my sacrifice, my life and my death are all for the sake of Allah”. While sacrificing, if this state and if these feelings of love and total obedience to Allah are not there, then merely shedding the blood of animals and distributing meat are all activities without any spirit. Allah Tala does not need blood of animals nor meat from animals. All that He requires from His slaves is the Taqwa, obedience and the feelings of self-sacrifice for their Lord. Thus the real spirit of sacrifice is that a man should leave his bad habits, stop following his wishes and desires and stop following traditions. Man should leave and sacrifice all those things in this world which stop him from attaining nearness to Allah. What to do in the first 10 days of Zil-Hajja? 1. Recite the masnoon dua when sighting the moon of Zul-Hajja. 2. Recite the Takbiraat as much as possible from the 1st Zil-Hajja to the 13th of Zil-Hajja. 4. Perform good deeds (Fasting, charity, voluntary prayers, zikr, etc.) as much as possible. 5. Observe the fast of 9th Zul-Hajja as it leads to expiation of sins of the previous year and the coming year. What to do on Eid Day? Do not eat anything on Eid-ul-Adha until after the Eid Prayer and the sacrifice; as this was the Sunnah of Rasool Allah (SAW). While on the way for Eid Prayer, recite the Takbiraat loudly. It is masnoon to offer the sacrifice at the place of Eid Prayer.